A powerful earthquake within a range of mountains near the border of two nations has unearthed an ancient mystery. A tower emerges from the destruction, seemingly untouched as the earth around it crumbled. The Academy, a powerful organization of the Northlands, wishes to know its secrets. A team has been selected to investigate this tower and unlock the secrets that lie within. Ruins of Rydos is a dungeon crawler old school RPG. Originally released as a demo for NaGaDeMo. Two main characters to choose from! Either choose the spearman Gerald, or his sister Brenda, the paladin. Explore the Ancient Tower's 30+ maze-like floors while fighting monsters and collecting treasure along the way. Charge into battle or sneak past enemies that are visible on the map. Random enemies, not random encounters! Engage in classic 2D turn based combat using powerful techniques and other abilities like alchemy. Navigate past deadly traps such as ground spikes and falling floors. Discover the secrets of the Tower with collectible items and secret areas to explore. Help the expedition's camp flourish! Invest in modest shops so they grow from stalls, to tents to full buildings! Today I worked on something I had been putting off for a while: 8-Bit Attack Animations! I had already made a few yesterday and came across a slight problem, the animations were transparent when used! So my first order of business for today was to rectify that problem. All I had to do was go into the Animation Tab in the database and select the animation I was working on. 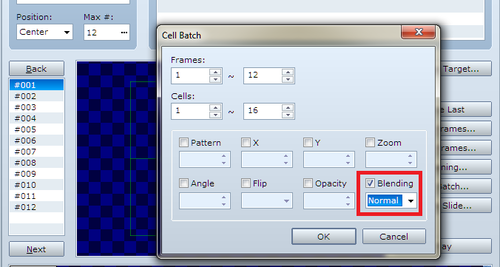 From there I selected the "Cell Blending..." option and chose "Blending -> Normal" for all frames of the animation. This may be elementary for some RM folks but as I had personally not messed with animations, this was a great discovery! Needless to say, my attack animations at this point remained opaque when used in-game. Seems this was the solution to all of my worries! Next on my list, was to make more animations! I plan on creating 8-bit animations for each skill used in Ruins of Rydos (in an attempt to avoid using any RTP at all). I managed to make a claw, bite, and striking animation with three unique frames for the former, and two unique frames for the last. This took more time than I would have liked, but I did get it done! 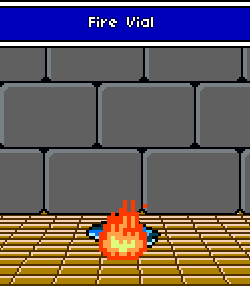 I then proceeded to implement these animations along with some adequate sound effects (SNES level if not NES/Famicom level) to help add to the "impact" of these attacks. Like I said before, I wasn't very familiar with animations, so dealing with these was definitely a learning experience for me. It was fun to figure out how many frames to use for each piece of animation to get the look I wanted, as well as which frame to trigger things like a flash on the enemy sprite. I also made sure that the sound effects I used lined up well with the animation. Once all of that was said and done, my enemies now had unique animations for their basic attacks. Enemies that appeared to be fond of biting now appeared to do so, enemies with claws got an animation, and everything else got a simple striking animation. Plus, the striking animation doubles for unarmed party members! So pretty, so hot, so flammable! I may have said this before, but I find it amazing how something as simple as an animation that only lasts for a few seconds (even if the player sees it ad nauseam in battles) can take up so much time to create and implement. Despite the brief showing of each animation, the feeling of satisfaction is definitely great. If you have any questions, comments or concerns, feel free to leave a comment below! A look into how the character portraits have evolved from the beginning of the project to now. How RoR is coming along, and how it will proceed in the coming months. Ruins of Rydos - Demo now available! A demo of the game Ruins of Rydos is now available. I'm happy to see some quality coming out of RPG Maker. Looking good. Nice and simple art style. I like it! Really wish I would of seen this earlier. Getting some major FF1 vibes. I'll track. Thanks! Glad you like it. Working hard on getting it done.